K9 BAR Academy offers training services in the areas of obedience, behavior modification, puppy imprinting , aggression, agility and more. We have five training options to choose from. These options include Board and Train, K9 Day Academy, Private Lessons, All Day Personalized Training, and group classes. Within each of these options, our trainers can customize a program best suited for you and your dog. Board and Train is ideal for people with a busier lifestyle that want quicker results. K9 Day Academy is also ideal for busy people. This training service goes to the pace of the owner and allows the owner to drop off and pick up the dog on a day to day bases. Private lessons are best suited for those who prefer more one on one attention. Group classes are a fun way to interact with other dog owners and learn new skills. No matter what your goal is for your dog, our professional trainers can create a program that will help you and your dog achieve success. K9 BAR Academy's rates are variable depending on the program chosen for your dog. Please contact us at 213-999-4466 for more information or to schedule a Free Evaluation. This is our most popular training program. This is a great option for those with a busy lifestyle, dog aggression issues, and also for those who prefer quicker results. Your dog will stay with us for a minimum of two weeks. Our professional trainers will give your dog a solid foundation in obedience, street manners, and home manners as well as work on behavior modification if necessary. At the end of your dog's stay, our trainers will spend half a day with you teaching you everything your dog has learned and how to continue to maintain the training in your home. Our trainers are also able to do board and train for more advanced training such as advanced obedience, agility, rally obedience, and canine good citizen training. This popular training program is also a great option for those with a busy lifestyle. It is designed for non aggressive dogs and for the dog to learn at the pace of its owner. Owners drop off their dog 1, 2, or 3 times a week. Your dog then trains three or more times during the day with each of our trainers. At the end of the day, before owners take their dog home, a fifteen minute lesson is taught with owner and dog. Because respect is not transferable, All members of the household should participate from time to time with a private lesson with us. Each household member will also need to train with the dog using our methods at home a minimum of two times a day. An all day behavior modification lesson provides one on one attention for you, your house-hold members, and your dog. This exclusive fast track lesson focuses on any behavior problem your dog may be having. Some basic obedience is also taught. The day will be planed out by K9 BAR Academy. Depending on the behavior issues your experiencing with your dog, We will plan the day either at your home, local park, street, or any other designated locations. We typically start early in the morning at your home and continue the lesson into the afternoon somewhere else. Most people who do this type of lesson, have a some what basic obedience foundation with there dog. This is not recommended for HIGH AGGRESSIVE dogs, we recommend Board n' Train for that behavior. Private lessons provide one on one attention for you and your dog. 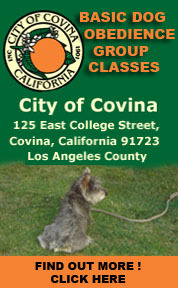 Lessons are typically once a week and will provide you with the information to train your own dog. Most people do lessons for 6 weeks to learn the basic exercises and then continue on with more advanced training including advanced obedience, agility, rally obedience, or canine good citizen training. 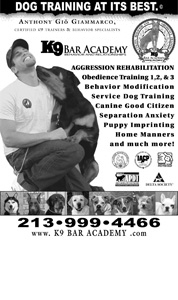 Private lessons are also available for any behavior problems your dog may be having. Our trainers can come to your home, or meet at a designated location. This option is a fun way to train in the company of other dog owners. K9 BAR Academy has a wide variety of classes to choose from including puppy kindergarten, basic obedience, advanced obedience, agility, rally obedience, and canine good citizen. These classes typically meet once a week and we prefer to keep our classes smaller. Class price, location, dates, and times TBA. Dogs crave our praise and approval, and teaching your dog tricks builds trust and communication as well as a stronger relationship with him or her. "Dog Tricks Training" program covers the classic dog tricks like Roll-Over, Circle, and High-Five, but it also covers more advanced tricks like getting his leash with methods like Behavior and Back Chaining. Trick obedience gives your dog exactly what he or she craves most: quality time with you! Basic obedience is what your dog needs before getting started with this class. Once you get going with basic tricks, you and your dog will have such a good time you'll get hooked, and before you know it, you'll be wowing everyone you know with your performances. We have been training Animals for service for years. Please call Anthony to talk about your private needs.